Iceland has substantial renewable and economically attractive options to increase its electricity generation. The National Power Company, Landsvirkjun, has introduced a vision for possible upcoming projects, that could increase the total annual generation from the present 17 TWh to 33 TWh by the year of 2025. Almost all of this additional generation of 16 TWh would come from new geothermal- and hydro power projects, but a small share might come from wind power. Almost doubling the electricity production in Iceland in a period of less than 15 years would call for massive investment. 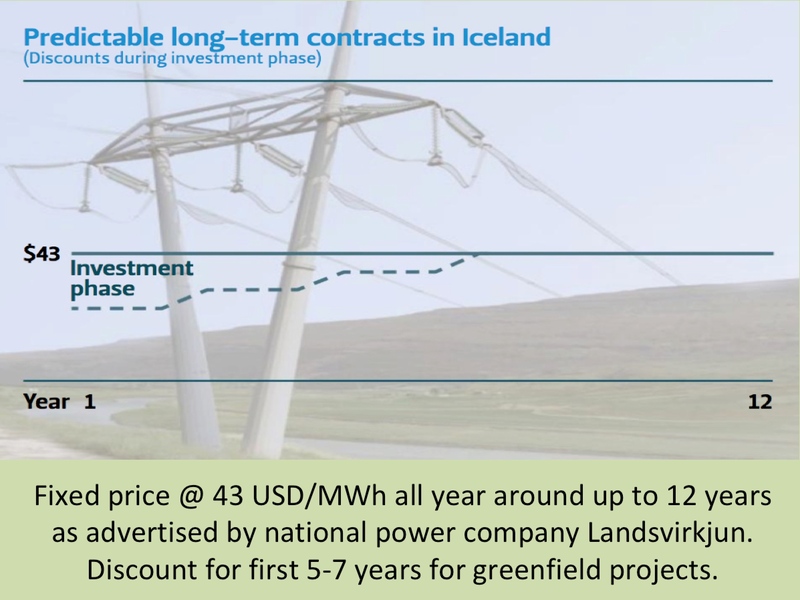 However, this investment could be fairly stable over the period, as most of the suggested power projects would be medium scale (and, for example, not as large as the 690 MW Kárahnjúkar / Fljótsdalsstöð Hydropower Plant, that was constructed in the first years of the 21st century). Electricity prices in Iceland have been much lower than, for example, in most of Europe. This price gap has been increasing, offering the Icelandic power industry the possibility to raise the electricity price and still be very competitive. Today, most of the electricity generated in iceland is consumed by the aluminum industry and other energy intensive industries. The long term contracts offer the electricity companies fairly stable revenues, but low profits. The increased price difference between Iceland and Europe may change this situation for the better. Today, Landsvirkjun is offering electricity contracts over a 12 year period, where the price is 43 USD/MWh. This is a very good option for small and medium sized companies, where electricity cost is a substantial share of their production costs. Several new contacts have already been signed. Two new data-centers are already in operation; Verne Global and Thor Data Center, offering services that run on 100% renewable energy. This growing data-center industry is also enjoying a major upgrade of the international submarine telecom capacity between Iceland and mainland Europe . Another example of new power contract is an agreement between Landsvirkjun and GMR (Geothermal Metal Recycling), where clean, renewable energy will be supplied to power a new steel and scrap metal recycling plant at Grundartangi in Southwest Iceland. Also, the German industrial holding company PCC and the French construction-materials giant Saint Gobain are considering Iceland as a location for their production. 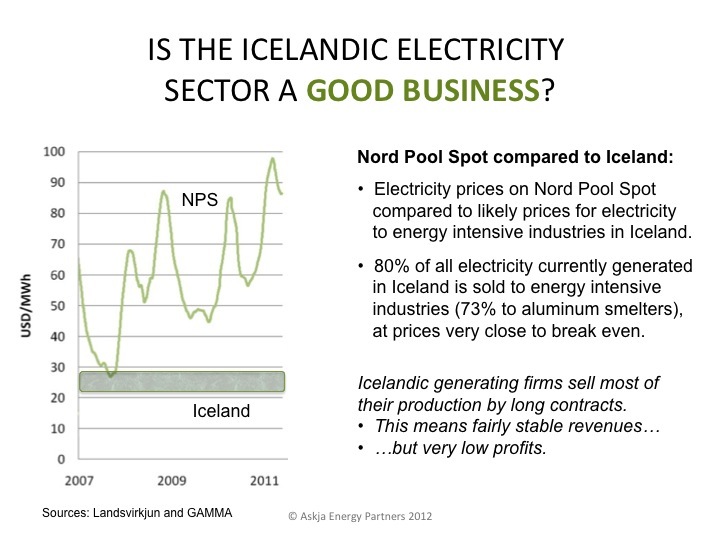 It is too early to say how fast the Icelandic electricity industry will grow in the forthcoming years. If the electricity prices in Europe will continue to rise, as the consulting and engineering firm Pöyry has been forecasting, Iceland’s competitiveness will increase even further. 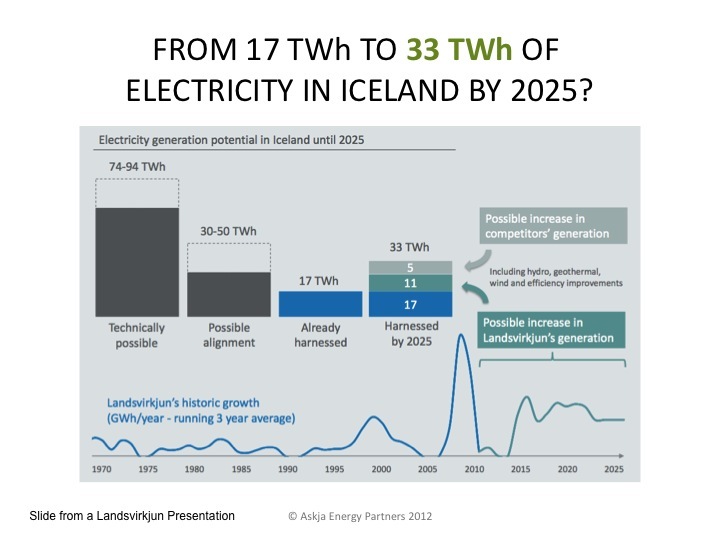 For more information about these possibilities we recommend a recent analysis by Gam Management; Landsvirkjun’s Renewable Energy Potential and its Impact on Iceland’s Economy.